Again, more churches in various parts of Naples. And again, they are no less interesting for their inclusion under this "miscellaneous" rubric. Santa Maria della Catena is best known in Naples as the final resting place of Admiral Francesco Caracciolo, executed in the wake of the fall of the brief Neapolitan Republic in 1799. He was hanged aboard ship and cut loose to sink in the sea; Neapolitan mythology holds that the body refused to sink, floating to the surface and eerily bobbing its way towards shore. Indeed, there is even a painting showing King Ferdinand aboard his ship, aghast at the sight of the admiral's corpse floating alongside. Whatever the case, Caracciolo's body was retrieved from the sea and his remains now rest in this small church. 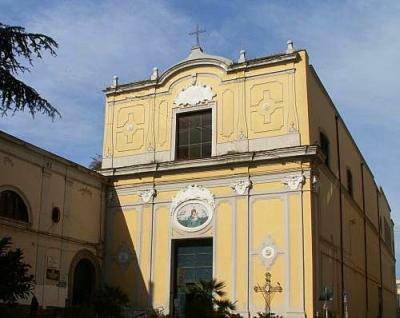 The church is in the Santa Lucia section of Naples and was founded by the fishing community in 1576, becoming a legitimate parish in the 1597. The street, via Santa Lucia, that the building fronts on, used to be almost at water's edge and, was, in fact, the main street leading up to the royal palace, a short distance away. That is difficult to see, today, since the urban renewal of 1900 put land-fill and extra blocks of large buildings between the church and the sea. That period of building changed the entire configuration of the coast line for hundreds of yards on both sides of the Castel dell'Ovo (Egg Castle), the most prominent landmark near the church. The church was restored in the 1850s after many decades of neglect. San Severo al Pendino is in the oldest section of the city, not far from the Cathedral as well as a number of paleo-Christian sites and sitting atop a treasure trove of as yet unexcavated Roman and even Greek ruins. The church is from 1575 but was built on the site of an earlier church, Santa Maria a Selice (of uncertain age, except that records show it to have been "rebuilt in 1448). The modest 19th-century look of the façade of the church is due to the fact that it sits directly on via Duomo, the main north-south boulevard that runs past the Cathedral (Duomo). That street did not exist until the late 1800s. Laying a straight road through the dense and ancient welter of buildings of the Pendino section of Naples meant slicing through and shearing off large sections of some buildings, even moving (!) entire buildings, such as the nearby Palazzo Como. The church was actually part of a much larger monastic complex truncated by the construction, and much of the original building simply no longer exists. The church of the Santissima Trinità is on via Tasso about halfway up the Vomero hill above the Chiaia section of Naples. It is of recent construction (1934) but is purposely similar to the church of St. Thomas Aquinas, which was on the same site and torn down in 1932. The interior has a single nave with five chapels on either side and contains considerable trappings from the earlier church, including the main altar from the 1630s, the work of Costantino Marasi and Giovanni Mozzetti. The large canvas depicting Episodes in the Life of Thomas Aquinas is also from the 1600s as are the secondary altars. The ornate wood carvings in the church are from the 1700s. Sant'Antonio a Posillipo commands one of the most striking panoramas in the city. The church sits on the Posillipo height above Mergellina facing southeast with a view of the Chiaia section of town the bay itself, the isle of Capri, and the Sorrentine peninsula. Originally a monastery, the church was founded in 1642 by brother Paolo Anzalone of the Third Regular Order of St. Francis. 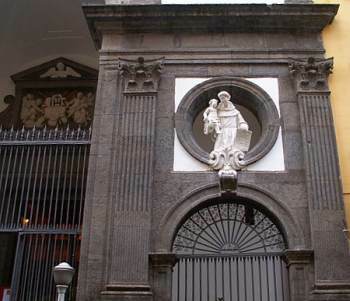 The order was suppressed in Naples under the French in 1809; in 1835 the Dominican order took over the premises; they, too, were suppressed by the new national government in the 1860s, then restored in 1883. The church was remodelled in the 1950s and, except for the onion-dome belfry held over from the 1750s, does not look at all like the structure seen in 18th-century depictions of the area. There remain within the building works of art from the 18th-century, but even as early as 1845, one source complained about the unremarkable architecture of the place. Yet, because of its location, the house of worship was (and remains) a favorite target for a "short pilgrimage", if you will--i.e., you can hike up to it from the church of the Madonna of Piedigrotta at Mergellina, below, along rampe Sant'Antonio, the steepest and crookedest road in Naples. At the end, if you can trick yourself into confusing exertion with devotion, you may feel that you have done something worth being blessed for. The Church of Saint Martha (#4 on this map) is at the western entrance to the historic center of the city near the tall belfry of Santa Chiara. The church was founded in 1400 at the behest of Queen Margherita of Durazzo and dedicated to Saint Martha, who played prominently in the religious life of the queen's native Hungary. The church used to be the premises for one of the most important brotherhoods in the city, to which various sovereigns and noblemen belonged. They would record their presence with signature and coat-of-arms in a book of parchment now stored in the Naples archives. The church was damaged in Masaniello's Revolt (1647) and since then has undergone various episodes of restoration. The premises contain art work by Andrea Vaccaro. Santa Maria in Portico was built in 1632 and, at the time, was almost on the beach, which fact is difficult to appreciate, what with the intervening centuries of urbanization (including the large park, the villa comunale) that have pushed the church "inland," so to speak. The church was one of those that grew up in the 1600s to serve the needs of the then new community of Spanish nobility that was stringing sumptuous villas along the seaside. The architect was Nicola Longo and the edifice was financed by the duchess of Gravina, Felice Maria Orsini, whose vast property was adjacent to the site of the church. The church grounds were originally much larger than what one sees today and included monastic quarters and a number of gardens. The complex also contained at one time the Orsini art collection and was, in fact, so palatial that the new Spanish viceroy, Marquis del Carpio, chose it as his residence upon his arrival in Naples in 1683. The closing of nearly all monastic property in Italy in the 1860s following the unification of Italy led to an inevitable breaking up of the complex, but it is still impressive. The facade is apparently not by Cosimo Fanzago, as was long thought, but rather by Arcangelo Guglielmelli and was done in 1682. The Church of Santa Maria Maggiore (#38 on this map) is one of the four large basilicas of paleo-Christian Naples that came into existence after the Edict of Constantine of 313 a.d. declared religious tolerance. (The other three are the churches of San Giorgio Maggiore, San Giovanni Maggiore and the Santi Apostoli.) The complete name is S. Maria Maggiore della Pietrasanta. It was built in 533, and its origins involve a strange tales of ancient Naples. In 533, the Virgin Mary is said to have appeared to Bishop Pomponius of Naples and commanded him to chase away a swine possessed of the devil that had been frightening citizens of the area. He did and then built and consecrated this church on the site of an earlier Roman temple dedicated to Diana. The relatively modern appearance of the church is due to the reconstruction of 1653.The remarkable red-brick belfry on the grounds is the oldest free-standing tower of its kind in the city. It was part of the original church complex, though built later (c. 900 a.d.). The church of S.M. della Neve (Our Lady of the Snow) is from 1571 and is on the Riviera di Chiaia, across from the west end of the Villa Comunale. It used to be right on the beach and easily accessible to the community of fisherfolk that had grown up in the mid-1500s well outside of the main body of the city of Naples. The church would then be one of about half a dozen that would stand amidst the long string of exclusive villas of Spanish nobility, who also started to move out of the city at about the same time. Some fishermen still work out of nearby Mergellina, the Spanish villas have long since been subdivided, and water's edge has moved about a block away to the other side of a lot of landfill and a new seaside road laid in about 1900. The strange name of the church derives from the legend of the Miracle of the Snow; that is, the Virgin Mary is said to have appeared in a dream on the night of August 5, 352 A.D. to a wealthy Roman couple as well as to Pope Liberius telling them to use the couple’s wealth to build a church on the spot that would be indicated by snow the next morning. Various paintings, including one from 1429 by Masolino da Panicale (in the Capodimonte museum in Naples), show the snow on Esquiline Hill the next morning and the Pope tracing in it the outlines of the new church. 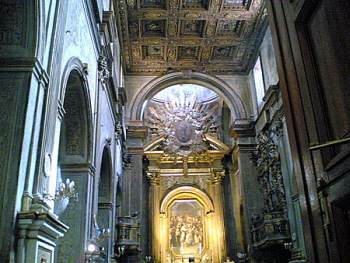 The church was built and has been rebuilt many times and is today the basilica of Santa Maria Maggiore in Rome.There is a fresco of the snow episode in this Neapolitan church, but it and other works of art within the church, all from the early 1600s, have not been maintained well over the centuries. 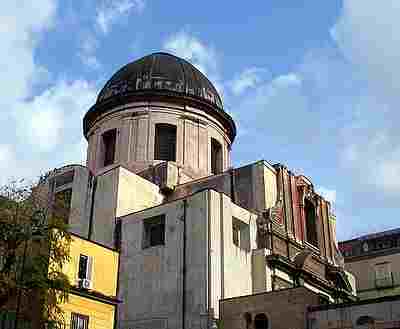 The church of Gesù delle monache [Jesus of the sisters] is about 50 yards in from the old northern city gate, Porta San Gennaro. The church used to be adjacent to the gate before 1537 when the Spanish rulers of Naples decided to expand the city walls, moving them outwards wherever possible and, indeed, moving and rebuilding many of the gates, themselves. The original house of worship on the site—as is the case with many places in Naples—was a large convent plus church. Thus, the church that one sees today is much smaller than the original complex. The original, in this case, was a Franciscan monastery built at the time of Joan II at the beginning of the 1400s. Later in that century, Joan III, the widow of Aragonese ruler Ferrante, expressed the wish to turn the complex into a sort of pantheon for the ruling family of Naples, the house of Aragon. The dynastic change in Naples in the early 1500s, however, changed all that; between 1527 and 1582, the complex was rebuilt into its present form, at which point it acquired the name Gesù delle monache. The entrance and main facade are on the west side of the original building. There were later, splendid changes to the façade and interior during the Baroque period. The convent part of the facility is now a school, with the entrance around the corner on the street that runs along the north side of the building. The inside is particularly rich with names of artists from the Neapolitan Baroque, including Francesco Solimena, Paolo De Matteis and Luca Giordano.